The Fantasy Baseball Today Podcast talks the key news, overreactions, most added and previews Week 4. The early season is producing lots of surprises, which is part of the fun. 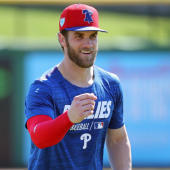 So which of these hitters are we are buying into (9:15) on Monday's Fantasy Baseball Today Podcast with Scott White and Adam Aizer? Freddy Galvis? Alex Gordon? Leonys Martin? And then there's Jesse Winker, a guy many of us liked (3:00) as a major sleeper hitter who started the season looking like a flagrant bust. But the Reds outfielder caught fire last week with four homers in five games, much to the chagrin of Fantasy players who dropped him after a 1-for-26 start. "This is a big week for Winker," Aizer said. "He's got four lefties on the schedule. They've got four left-handed starters on the schedule, and I don't think they've faced a lefty starter all year." "Yeah, it's a good idea to bench him for now if you can," White said. "Five-outfielder leagues you may not have a choice. But hopefully this is a sign of him turning it around and living up to the sleeper expectations I had for him and other people in the industry had for him."